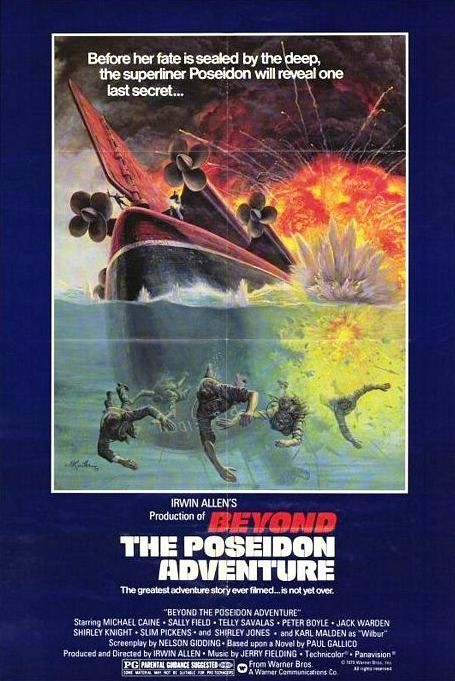 Following 1978's unmitigated flop The Swarm, Beyond the Poseidon Adventure (1979) offers a little redemption for producer-director Irwin Allen and star Michael Caine. Let's be clear: This belated and unnecessary sequel to 1972's The Poseidon Adventure is not a good film. But it is a watchable film thanks to an interesting cast and the many ways it manages to rehash the first film. Caine plays Mike Turner, a small-time ship captain with financial difficulties, who loses his cargo in a storm at sea. Turner, first mate Wilbur (Karl Malden), and "passenger" Celeste (Sally Field) get a break when they happen on the capsized Poseidon. Turner plans to board the luxury ocean liner and recover any valuables, which he can then claim as salvage. Michael Caine, Karl Malden, and Sally Field. Before he can execute his plan, a larger ship arrives at the site. Its captain, Dr. Stefan Svevo (Telly Savalas), states his mission is to rescue and provide medical services to the remaining survivors. Turner and Svevo both lead parties into the bowels of the Poseidon--which Wilbur dubs a "floating time bomb"--and are quickly trapped inside the sinking ocean liner. There are few surprises in Beyond the Poseidon Adventure. It turns out that Svevo has an ulterior motive which has nothing to do with saving passengers. That leaves Turner to become the reluctant hero as he finds passengers who were apparently left behind at the end of the previous film. Mark Harmon and Angela Cartwright. Those survivors include: an overprotective father (Peter Boyle), his daughter (Angela Cartwright), the daughter's burgeoning boyfriend (Mark Harmon), the ship's nurse (Shirley Jones), a blind man (Jack Warden) and his wife (Shirley Knight), a socialite (Veronica Hamel), and a self-proclaimed Texas billionaire (Slim Pickens). Naturally, not all of them will make it to the end of the film! The original Poseidon Adventure is one of the best disaster movies, thanks largely to Gene Hackman's commanding performance. As much as I like Michael Caine, he doesn't put much effort into his lead role. His opening scenes with Sally Field, which include an overdose of playful banter, are painful. It's not hard to see why actors such as John Wayne, Burt Reynolds, and Clint Eastwood allegedly turned down the part. To her credit, Sally Field eventually rights the ship (no pun intended) as the always-optimistic Celeste. Her best scene is when she volunteers to help Caine just so she can cry out of sight of the other passengers. As for the rest of the cast, it's fun to see Slim Pickens hamming it up as a Texas oil man and to watch a young Mark Harmon paired with Penny Robinson from Lost in Space. 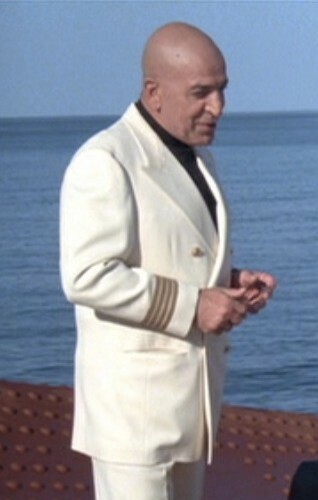 And I must admit that Telly Savalas' first appearance, dressed in an all-white uniform, made me think he was reprising his role as Blofeld from On Her Majesty's Secret Service. Surprisingly, the special effects--always a highlight in an Irwin Allen production--are somewhat shoddy. There are some embarrassing rear-screen shots at the start of the film. And when Caine and Malden are navigating their tiny ship through a ferocious storm, one gets the feeling that a bunch of grips are just off-screen throwing buckets of water so they splash on the deck. 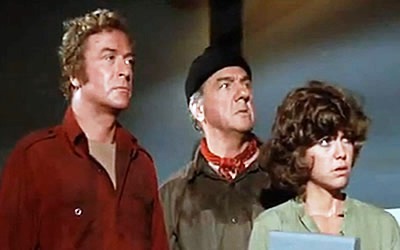 It's easy to criticize a movie like Beyond the Poseidon Adventure, but by the time Caine and Co. started focusing on how to escape from the ocean liner, I found myself getting involved in their plight. Yes, it rehashed much of the original with folks bickering among themselves as they jump across huge holes in the hallways and climb creaky ladders with flames blazing below them. I expected all of that...along with the stereotypes and the obvious plotting. That doesn't mean it was any less fun. 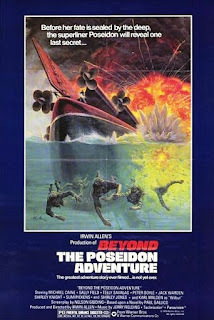 Here's a clip from Beyond the Poseidon Adventure courtesy of www.warnerarchive.com. You can view it full-screen on the Cafe's YouTube channel. 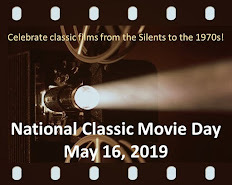 (You can also stream the entire movie at Warner Archive). I'll have to check this out someday. I'm always up for a bit of unpretentious fun. This sounds worth it, despite any shortcomings. What a terrific cast! I'm embarrassed to admit I haven't seen the original movie yet, but am eager to see it now and to follow it up with this "unnecessary sequel" (as most are). The big draw for me is Karl Malden, post-Streets of San Francisco (and pre-Meteor, another disaster flick). What a fascinating cast drawing stars from such beloved series as Kojak, Partridge Family, Lost in Space, and the Flying Nun. And maybe an homage to Gilligan's Island judging by the description of Caine and Malden "navigating their tiny ship through a ferocious storm." Caftan Woman said it well: "I'm always up for a bit of unpretentious fun." Me too. I have never seen this movie but as soon as I saw the names of the cast I thought how good an actor KARL MALDEN was. I especially like him in movies that are different for him. He played the preacher in the DISNEY movie POLLYANNA with HAYLEY MILLS. Mr. Malden was also in the western THE GUNFIGHTER with GREGORY PECK. loved telly savalas in this flop. it has it's moments though. there are a few shootouts along the way. i also believe this was a tv movie so the budgets are limited. I agree Miss Hamel and Miss Knight are very attractive women. They are also very good actresses. 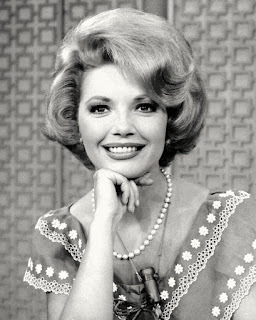 I have seen them in several TV Movies, I also remember seeing Miss Knight in an episode of THE FUGITIVE starring DAVID JANSSEN. It also had the sultry GLORIA GRAHAME as a scheming southern belle. Sam Peckinpah's TV Series "The Westerner"